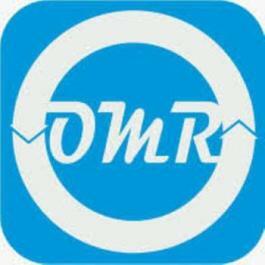 INDORE, INDIA, August 17, 2018 /EINPresswire.com/ — According to OMR analysis the global minimally invasive surgical instruments market is growing significantly during the forecast period 2018-2023. 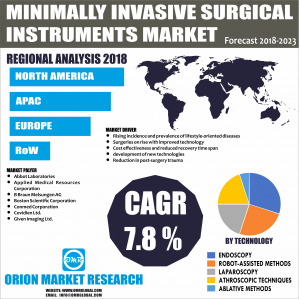 The global minimally invasive surgical instruments market has been segmented on the basis of product, technology and applications. The report provides detailed & insightful chapters which includes market overview, key findings, strategic recommendations, market estimations, device regulations, market determinants, key company analysis, market insights, company profiling, market segmentation, and geographical analysis. Increasing prevalence of lifestyle oriented diseases such as CVD is driving the demand for minimally invasive surgical instruments market. According to WHO, CVD is the major cause of death globally and more people lost their lives due to CVD than any other cause. CVD has accounted around 17.7 million deaths in 2015. It represents 31% of all global deaths. Among these deaths, 7.4 million were occurred due to heart disease and 6.7 million due to stroke. More than three quarters of CVD deaths witnessed in low and middle income countries. Such prevalence of CVD leads the demand for minimally invasive surgical instruments for the treatment of patients with CVD. The advantage of minimally invasive cardiac surgery is extensive than the open-heart surgery. Open heart surgery requires 6-8 incision in the chest and might be needed temporary placement of a pacemaker to regulate patient’s heartbeat. The global minimally invasive surgical instruments market is segmented into product, technology and applications. Based on technology, robotic-assisted methods are gaining significant popularity and technological innovations have been observed which is increasing the effectiveness of this technology. Robot-assisted methods are used in several specialties, including head and neck surgery, urology, gynecologic oncology, cardiothoracic and gastrointestinal. For example, In Dec 2016, Cambridge consultants developed Axsis robot to overcome challenges of current surgical robots, including the inability to act with extremely fragile and detailed tissues and large size of the robots. Like da Vinci surgical systems, Axsis doesn’t use rigid and long instruments, however, rely on flexible components results in the smaller size of the robot. Axsis is designed to perform cataract surgery. It has flexible, tiny and worm-like arms and controlled with a joystick that offers tactile feedback. Additionally, it has an internal algorithm autopilot that keeps the surgeons who are guiding it to not make dumb mistakes. The system assimilates with real-time 3D imaging that provides an advanced level of robotic assistance. Posterior Capsule (PC) tears are the most common serious complications in the UK. Axsis can reduce complications rates and develop patient outcomes.